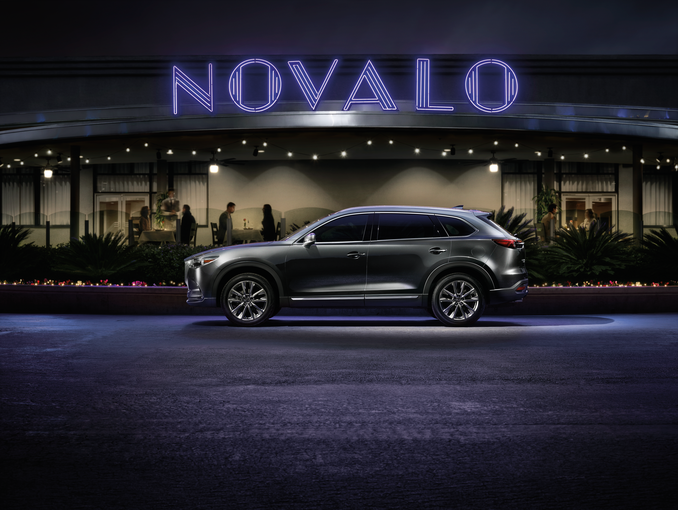 The 2019 CX-9 continues arriving at dealers nationwide. The 2019s carry minor styling updates and some interior upgrades. The upscale Touring and Signature models are generally easy to find. The entry-level Sport tends to move off lots quickly due to its lower price. 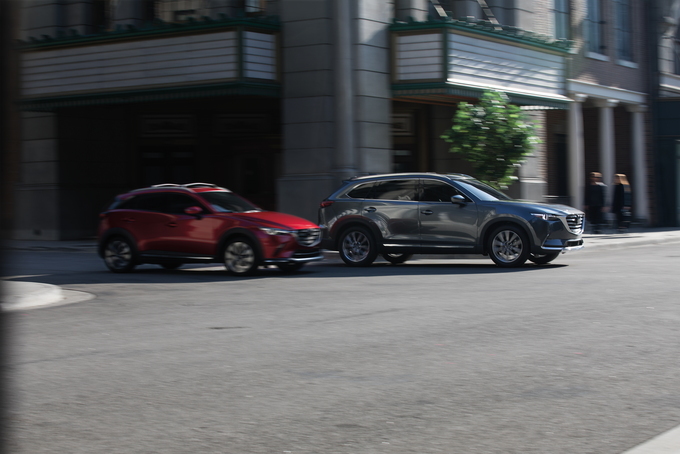 Interest in the CX-9 remains high, so don't expect deep discounting. Current factory offers vary by region and will remain in effect until April 30, 2019. Examples shown here are for Los Angeles. Mazda usually adds bonus cash for Memorial Day weekend in select regions. Mazda now offers a $500 rebate on the 2019 CX-9 to all buyers, double the previous amount. Current Mazda owners are also eligible for a $750 loyalty bonus toward a purchase or lease. The 2019 CX-9 Sport now starts at $325 for 36 months (12,000 miles a year) with $2,425 due at signing. The effective monthly cost is $392, a drop of $12 since last month. It's a good value in our book. 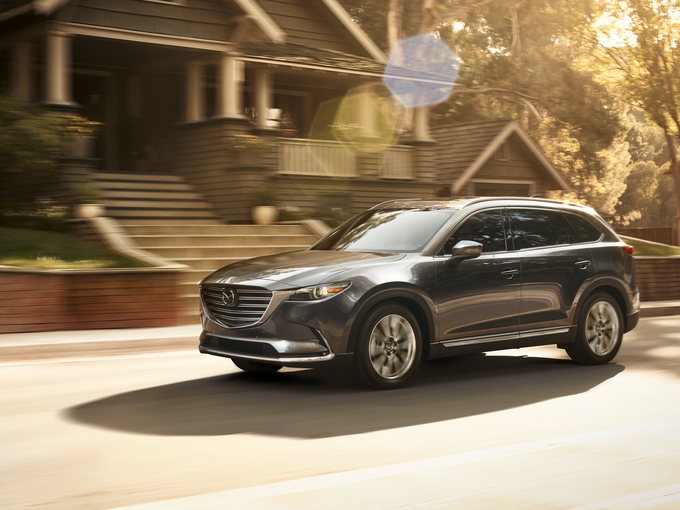 Instead of the standard rebate on a 2019 CX-9, you can get 1.9% financing for 60 months — a point lower than last month. You can combine this offer with the loyalty bonus if you qualify. Promotional APR Offer Promotional APR programs available for qualified buyers. Please check with your CarsDirect Trusted Dealer for complete details.%NotesManuf% %Eligibility% Residents in qualifying regions of the United States. Buyers who are approved by MCS. %Qualification% Eligible new and unused vehicles. EligibilityResidents in qualifying regions of the United States. Buyers who are approved by MCS. The Touring and above trims feature Apple CarPlay and Android Auto compatibility. A surround-view camera system, ventilated seats, and SiriusXM Travel Link are newly included features within the Touring Premium Package and above trims. Also, Mazda retuned and refined the suspension so the CX-9 can provide a quieter and smoother ride. Mazda’s biggest crossover is powered by a turbocharged 2.5-liter four-cylinder engine that was designed for easily accessible low rpm torque. Evidence of such turning lies with its relatively low peak 227 horsepower and very high 310 pound-feet of torque at just 2,000 rpm. Standard front-wheel drive achieves EPA estimates of 22 miles per gallon city, 28 mpg highway, and 24 combined. The all-wheel-drive system, which costs an extra $1,800, lowers these figures to 20/26/23 mpg (city/highway/combined). This available iActiv system is tied into the chassis systems to preemptively transfer power as needed. There are four trims available: Sport, Touring, Grand Touring, and Signature. The base Sport trim begins at $33,275 (all prices include the $995 destination charge) and includes notable features such as push button start, a seven-inch infotainment screen, LED headlights and taillights, and 18-inch aluminum wheels. Blind-spot monitoring with rear cross-traffic alert, an active low speed automatic emergency braking system, and an automatic 911 notification system add to the traditional suite of safety equipment. The only option package available, aptly named the Power Driver’s Seat and i-Activsense Package is priced at $1,290. This package adds a power driver's seat, heated front seats and side mirrors, auto on/off headlights, lane keeping assist, lane departure warning, adaptive cruise control with stop and go, rain-sensing windshield wipers, automatic emergency braking with pedestrian detection. The Touring trim begins at $36,325 and builds off of the Sport trim. Notable new features include leather seating, proximity entry, and a larger eight-inch infotainment screen that features Android Auto and Apple CarPlay. A power-operated tailgate, a couple of USB charging ports for the rear passengers, and a frameless rearview mirror with Homelink are also included to make life a little easier. An optional Touring Premium Package for $2,390 brings a Bose audio system with 12 speakers, navigation, a moonroof, three months of satellite radio, three years of SiriusXM Traffic and Travel Link Services, LED fog lights, second-row window sunshades, and front and rear parking sensors. The Grand Touring is positioned up one more rung and begins at $41,835 and includes several notable driver-centric features such as a seven-inch TFT screen within the combimeter, active headlights, a head-up display, and a heated steering wheel. Ventilated seats also add to the driver’s comfort while a surround-view camera system aides in parking and exiting situations. Larger 20-inch wheels and heated rear outboard seats round out the impressive gains with this trim. There are no optional packages available for the Grand Touring trim. The Signature trim checks in at $46,360 and comes standard with the all-wheel-drive system. The interior presents a more luxurious atmosphere with Nappa leather seating and trim surfaces, genuine wood inserts, and even a unique stitching pattern for the steering wheel’s leather. The front grille’s LED backlighting is impressive and is integrated within the rest of the design. LEDs are used for the interior overhead lighting as well. The 2019 Mazda CX-9 brings a level of athleticism that's not typical in the large crossover field. 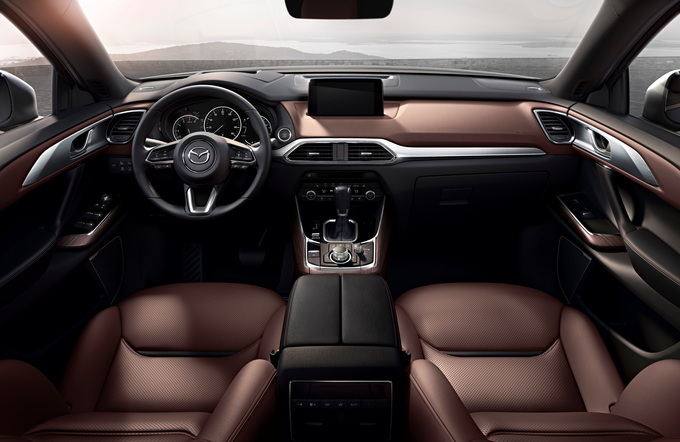 The Touring trim with the optional package packs the CX-9 with active safety equipment, the latest in infotainment sources, and an immersive audio system. Gorgeous styling. 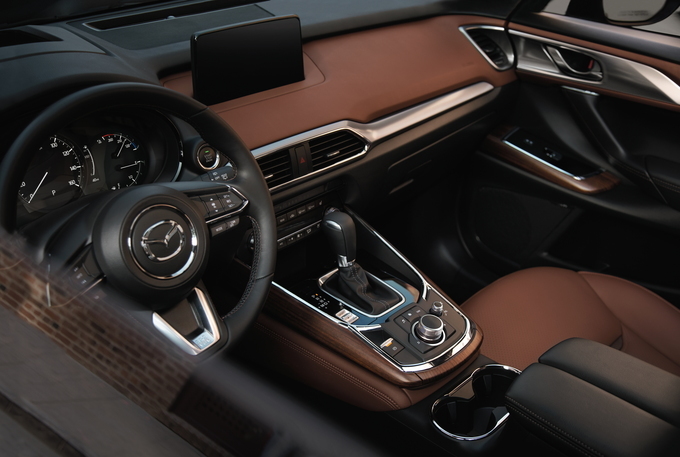 Exceptionally stylish and alluring for a crossover, the 2019 Mazda CX-9 outshines every other vehicle in its class – mainstream or luxury and domestic, Japanese, or German. It starts up front with a large, aggressive version of Mazda's signature five-point shield grille set into the fascia, sporting large, horizontal bars, and flanked by narrow headlight housings. Unlike most crossovers, not a straight line can be seen, as the sporty silhouette features crisp, sensuous, and sculpted lines, with either 18- or 20-inch wheels filling the arched housings. LED headlights and taillights are standard, with Grand Touring and Signature models adding adaptive front lighting, LED fog lights, a glass sunroof, aluminum roof rails, and chrome lower moldings up front, along the sides, and in back. Luxurious interior. The interior is equally stunning. Belying its modest $33,325 base price, even the Sport model offers class-above materials, from finely-grained plastic trim and soft-touch surfaces to the silky-smooth feel of the switchgear. The seats could use more padding as they're somewhat firm for American tastes, but they're nicely bolstered, and still manage to offer all-day comfort in our experience. Moving up to the Touring trim – our pick as the best buy in the lineup – swaps the Sport's cloth seats for leather in the first two rows and heats them up front. Front chairs are also cooled in Grand Touring and Signature models, with the Grand Touring featuring real aluminum trim. The sybaritic Signature model swaps that out for Santos Rosewood along with Nappa leather seating. Small spaces. But much of the goodness ends at the second row. Third row occupants, which should be limited to small children, are faced with a mere 30 inches of leg room, 40 inches of hip room, and 35 inches of head room. 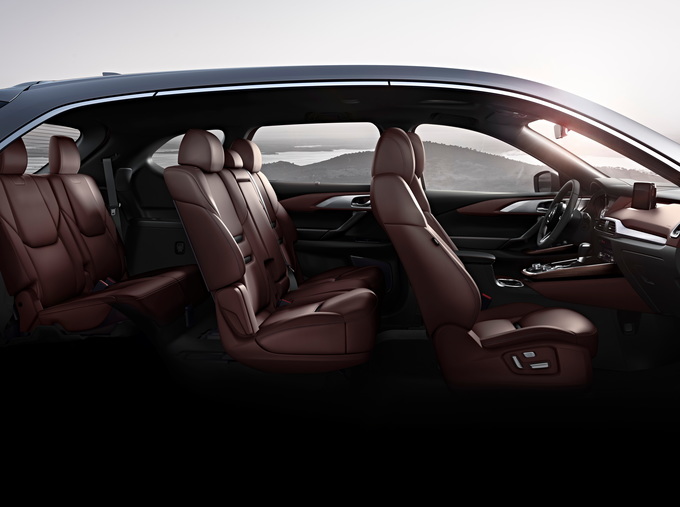 At the same time, cargo space pays a penalty for the CX-9's descending roofline where, with the third row up, a mere 14 cubic feet is available, with the vertical space for items limited by the steeply raked back glass. Fold the third row - a move that we suggest should be more or less permanent – and storage space increases to 38 cubic feet. With the second row down, up to 71 cubic feet of storage space is available. Kludgy infotainment. First the good news: Mazda has taken a step toward improving the infotainment experience by making Apple CarPlay and Android Auto standard on all but the Sport trim – yet another reason to choose the Touring model. While we applaud the effort, there are still issues that need to be addressed. To begin with, for some unknown reason, the display screen isn't touch-sensitive, which means users are entirely dependent on a clickable dial. In addition, the software, with its various menus and sub-menus, is hardly user-friendly. Entering station presets requires patience and multiple references to the owner's manual, while choosing between the convoluted OEM navigation system and Apple Maps is a no brainer. Enough said. Smaller is sometimes better. 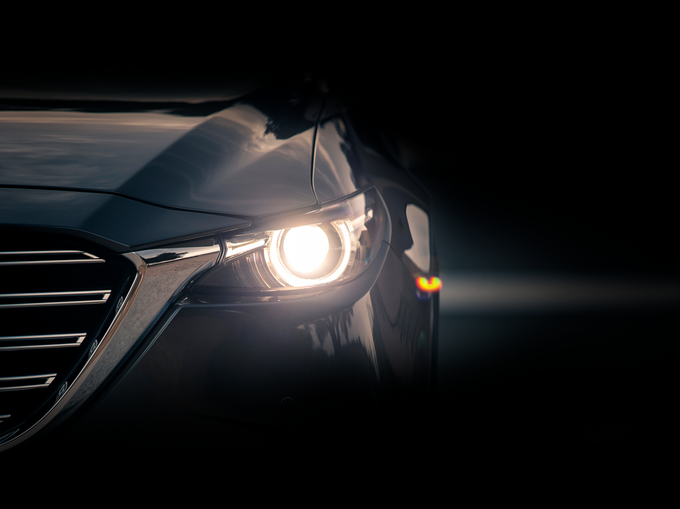 Like all Mazdas, performance is central to the CX-9's character. Despite being down a pair of cylinders compared to many rivals, the 2.5-liter four-cylinder features Dynamic Pressure Turbo technology that allows for a quicker response below 1,500 rpm than a twin-scroll turbocharger, a maximum 310 pound-feet of torque at a very usable 2,000 rpm, and 227 horsepower using regular gasoline that rises to a more competitive 250 hp with premium. Using a turbo-four also benefits fuel economy, which stands at an EPA-estimated 22 miles per gallon city, 28 mpg highway, and 24 combined. Most contenders in the class only manage to return city mileage in the high teens and highway mileage in the mid 20s. At the same time, despite the turbo's willingness, acceleration feels hindered by the CX-9's aging six-speed automatic transmission at times. Final thoughts. Hardly perfect, the 2019 Mazda CX-9 loses points for middling cargo capacity, an inadequate third row, and a frustratingly complex infotainment system. At the same time, a strong engine, near-luxury interior, and a stunning design bring a sense of style and exclusivity to the mainstream crossover segment. Looking at the competition, the Chevrolet Traverse's third row offers 33.5 inches of leg room, 48.5 inches of hip room, and 38 inches of head room, while the Honda Pilot offers 32 inches, 45 inches, and 39 inches, respectively.